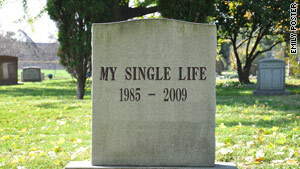 Writer wonders if you have to mourn your single life before having a committed relationship? She fears she's "being forced to choose between bad and worse"
(The Frisky) -- I was a little bit unsettled when I read a recent Cary Tennis column on Salon called, "I'm 32 already. Time to get married!" I realized that I could have written the question myself (well, I just want to meet someone great). A woman is torn between wanting to meet a life partner and wanting to follow every fun, salacious flirtation that comes her way -- because, after all, isn't that the best part of being single? Tending to choose the latter, she knows that it will not ultimately get her what she wants. It really hit home when she said, "It seems like I have only two options -- be myself, have fun, and then get rejected; or be constantly on guard, suspicious of all men, keep them at arm's length, and maybe get a second date." Get outta my head, lady! That is totally my dating dilemma -- being forced to choose between bad and worse. Being experienced enough to know that there are no guarantees, it only makes it easier for me to choose the path of least resistance ... go with the moment and throw away the future. But in the end, the moment passes and the empty future lurks ahead. "How do you become ready to move from one stage of life to the next? It helps to openly admit that it's going to be sad to leave this stage of life you've enjoyed so much ... Give away what you have been withholding and withhold what you've been giving away. It means get real. Tell him you want a man to fall in love with and stay with, and if that's a problem for him then OK there are plenty of chicks ... because if you want a lifetime relationship it will be full of honesty and vulnerability and pain." A lifetime of honesty, vulnerability, and pain? Ack! Does that sound really unappealing to anyone else? Wait ... if that's what it's like -- do I even want that? I am imagining how this recommendation would play out in real life. The Frisky: How should friends and family treat your ex? "Hi. I'm Ami. I want to get married eventually. I am wounded from years of empty and unsuccessful dating and am ready to get vulnerable. So are you up for it? Because, if you're not, there are plenty of other chicks out there." How fast would that guy be out the door? And after I drop that bomb, according to Cary, I am supposed to: "Waste this dude's time. You are not looking for a dude who is checking his watch to see if you've taken your clothes off yet. You're being your true, cautious, wounded, loving self. You do not want a man who is looking for convenience. You're ready for a new kind of life. Open the door to it thoroughly, passionately, completely, and I have a feeling it will come." Well, I'm not so certain. There must be another way. Do I really have to say goodbye to my single life in order to find love? Anyone out there have any suggestions that include me still having fun while trying to meet someone special and not baring my soul on the first date? Please advise or else I guess I'll see you at the funeral for my single life.